Televisions aren’t usually interesting enough to turn a whole lot of heads. Sure, everyone drools over that expensive flat panel TV that’s twice the size of your current one, but they’re pretty much all black and shiny. LG is bringing out a very retro new TV that’s definitely a breath of fresh air if you’re tired of the same old black framed televisions. Sure, this is going back a little in the times, but sometimes it’s nice to go back to the old. Especially since at times it feels as if anything remotely new is looking a bit generic. This isn’t actually a TV where new technology is concealed inside of an old frame. It’s really an old fashioned 4:3 aspect ratio cathode ray tube. The 14-inch screen may not be new technology but at least it looks a bit newer. Plus some people swear that old games just look better on the older televisions. These LG Serie 1 TVs are retailing for about $216 in Korea. 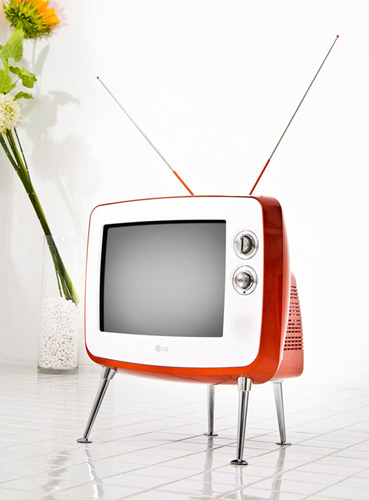 I want to buy this retro Tv but it is only on sale in Korea. Can I buy this somewhere online?